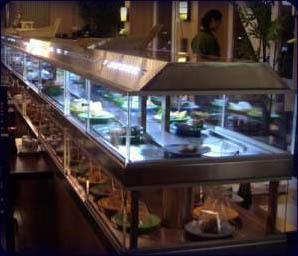 If you want to dine in a more relaxed atmoshere, you should definitely try our popular Running Sushi Buffet. Two belts bring over 50 different dishes directly to your table, including sushi, salads, warm dishes, and deserts. For a set price, each guests gets a miso soup and can help himself from the belts as many times as he wants.